There are lot’s of good reasons to separate applications into layers. One of the best reasons is to allow the application to easily be extended and maintained. Even in this small project, separation is a good. The roadmap for this project involves many different presentation layers. In order to re-use the data access / business logic layer implementation, this code is placed outside the Visual Studio web application project in its own class library project. The hope is that this code can be re-used when we throw away the ASP.NET presentation layer and build up a new one (with WPF for instance). Photo Thumbnail – To increase responsiveness of the application, a thumbnail is generated for each photo. These thumbnails are stored in the file system in a separate root folder (configurable) than the main image. I once used a photo gallery application that injected the thumbnails into the same folder as the image. It was very painful to later remove these thumbnails. Photo Metadata – Each photo has the potential to have additional information associated with it. This metadata will be stored in an xml file. The data access layer and business logic layer for this application are minimal and I have made the architectural decision to combine the two into one layer. In this case the added complexity of separation does not justify the additional overhead. Privacy Options – This is used in conjunction with the user type information (see below) to determine access rights to the photo. Rotation Options – This is used to set the “top” of the photo. The rotating of the photo is done in memory just before it is displayed. So the original is kept in tact. The LoadPhotoMetadata and SavePhotoMetadata methods are static helpers that handle the serialization operations. The metadata is serialize to an xml file. Not every photo will have an xml metadata file. 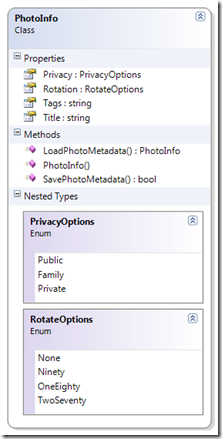 The constructor is used in this case is used to provide default metadata. // Create the path for the metadata file. // Open up a file stream for saving. // Serialize out the data. // Validate the existence of the data file. // File is not there...create a new database. // Open a stream for reading. 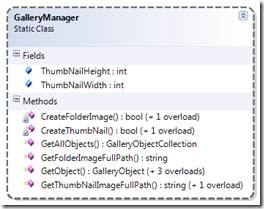 The GalleryObject class contains the information for each “object” in the gallery. The GalleryObjectTypeOptions enumeration indicates if this object is either an image or a folder. I like providing named collection classes for objects that will generally be used in a collection. 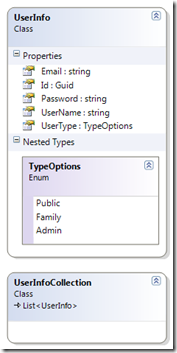 This provides a “typed” object and a cleaner development API for those utilizing the objects. The main interface to the photo gallery data is provided by the GalleryManager class. All the methods & fields of this class are static. The two fields of this class define the dimensions of the thumbnail image. After some trail and error I settled in on 130×97. Two opposing forces were at work here. I wanted the size big enough to allow many details in the thumbnail. This will hopefully prevent the need for every image to be viewed at full resolution. I also wanted my vision for what should be on the screen to fit on one page. 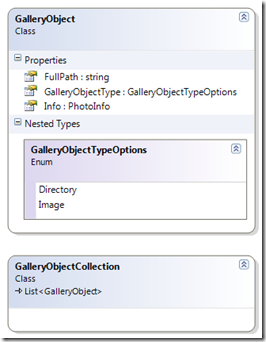 The GetObject methods provide various overloads to instantiate a GalleryObject. 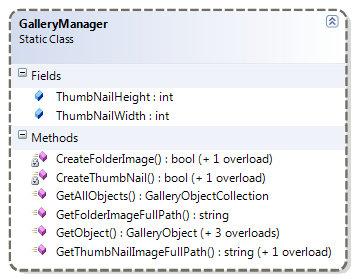 All the overloads are eventually call the method that takes the image path and gallery object type (image or directory) as parameters. This method creates a GalleryObject and loads the PhotoInfo metadata. // Create a gallery object. // Load the photo metadata. //    use the file name. // Instantiate the return object. // Validate the folder exists. // Enumerate the child folders. // Don't inlcude system folders. // Only include folders that have images. // Get the gallery object and add it to the list. // Only show jpg images. The GetAllObjects method takes a directory path as a parameter. It enumerates all the directories and files in that folder. It uses the overloaded GetObject methods to create a GalleryObject for each of these that contain images. This method is used to populate the film strip in the presentation layer. All GalleryObjects (both images and directories) have a thumbnail image. There are three helpers methods to convert either a directory / image path or a GalleryObject into a path to a thumbnail image. If the thumbnail does not exist, then one is created. 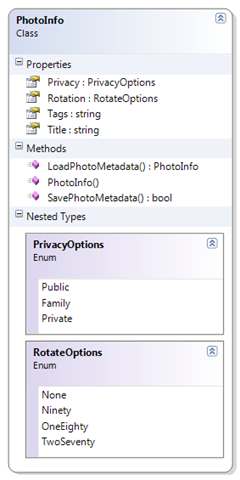 Notice the methods take that paths to the photo root folder and the thumbnail root folder. This allows that type of configuration data to be determined outside of this implementation. // Create it and return it. // Return the one that exits. //    to the folder image (thumbnail). Earlier I stated that the dimensions of my chosen thumbnail size are 130×97. In other words the resulting thumbnail image is always landscape regardless of the initial image layout. To convert a landscape initial image to a landscape thumbnail presented no real issues. However, converting a portrait initial image to a landscape thumbnail required a bit of code. This code keeps the important content of the initial portrait image in the landscape thumbnail. Since most people tend to center the content in their images, the thumbnail creation code takes the center portion of portrait images when converting them to landscape. // Create the new image. // Try to save this file. // Load the full size image. // Create a blank thumbnail image. // Get the GDI drawing surface from the thumbnail image. // Initialize the drawing surface. // Fill the image with white. //    that allows us to keep the aspect ratio we want. //    will line up with the original. Slide the height to the middle of the image. //    people will center their content in the image. // Draw the selected portion of the original onto the thumbnail surface. //    This will scale the image. // Clean up gdi resources. In preparing for this project, I examined a number of other photo galleries. Mostly to see what other people are doing and to accumulate ideas for requirements. I found the presentation of directories from the ASP.NET Photo Handler by Betrand LeRoy very visually pleasing. Each directory’s thumbnail consisted of a “stack” of images contained within the directory. The presentation provides a very intuitive user experience. The licensing on that application allows derivative works, but credit to where credit is due. // Set the return image size. // Create the return image. // Get the graphics surface and initialize. // Fill the image with white but fully transparent. // Generate a list of images to draw. // Look for default images first. // Use any image to fill the stack. //    in the main drawing loop. // Draw each image in the stack. // Read the original image. // Get the width and height of the original image. // Landscape mode picture....scale the height to fit. // Portrait mode picture...scale the width to fit. // Randomize the tilt angle. // Create a pen to draw the border. // Free the gdi resources. // If necessary draw the navigation arrow. // Set the qualities that define the arrow. // Create a pen to draw the arrow. In addition to photo data, there is user information that is necessary for authentication and access rights to images. The UserInfo class is used to encapsulate a user instance. 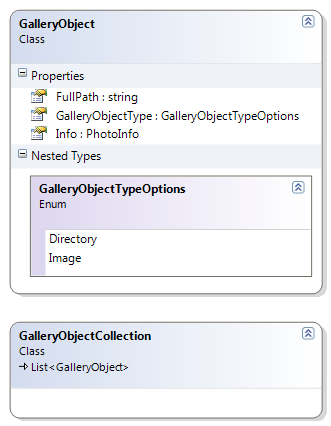 As before a UserInfoCollection class is provided to allow named types to be used as the development API. 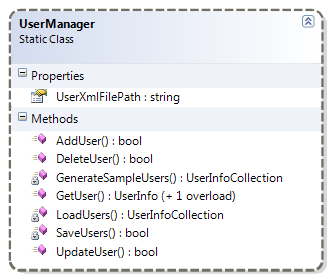 The UserManager class provides static helper methods for all the CRUD (create, read, update, and delete) operations. User data is serialized out to an xml file. 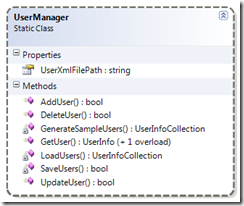 Before being used, the static property UserXmlFilePath must be set to the location of the user data xml file location. The LoadUsers and SaveUsers private methods handle the serialization of the data. The GenerateSampleUsers private method is used to create sample users for testing. // Get the current book list. // Add the new book to the list. // Write the modified collections. // Sort by descending dates.